This book was always on my wishlist, but somehow did not get down to reading it, until I read The Krishna Key by the same author. In 340 BC, a young man, Vishnugupta, vows to avenge his father’s death. He decides to call himself Chanakya – Chanak’s son from then on, and worked on his agenda of uniting Bharat and making it strong enough to withstand attacks from outside. He fulfils his vows by installing Changragupta Maurya on the throne of the Maurya Empire, using cunning, deceit, strategic planning and thinking ahead of his adversaries. Centuries later, Gangadhar Mishra seems to be a kingmaker of epic fame, using tactics not dissimilar to those used by Chanakya. A small town boy, faced with financial difficulties after the death of his father, overcomes all the obstacles in his path to become the most important man in Indian politics. A kingmaker who holds all the strings, and manages to pull them perfectly to attain his goal. Uncannily similar to Chanakya, a few centuries ago. It is a captivating story, pacy, entertaining, and revealing. The wheeling and dealing that go on behind the scenes, the games people play for power, the sacrifices, voluntary and involuntary, the cruelty, and the heartlessness with which people get to their goals. Power, the all important thing, nothing seems to be more important, lives, emotions,relationships everything seems to secondary. A story which seems to be an accurate portrayal of the political scene in modern India. What was even more fascinating was that it seems to have been true even during Chanakya’s time. The book brought to life the political turmoil, and the personal agendas that helped establish the Mauryan Empire in India’s history, while drawing parallels in today’s political world. Far more interesting that the way we read all this in our history lessons, ages ago, I have to say.I loved the author’s storytelling style, in which he had both eras happening in simultaneously, in different threads, in every chapter. The one thing I would have wished for, is that Chandni Gupta’s character had been better defined. While Gangasagar’s character in the book was well defined, I felt that Chandni’s was lacking. She felt a little hollow sometimes. Her motivations unclear. As if she were just a puppet with no mind of her own. Chanakya’s motivations seem to be quite clear, while Gangasagar, to me, just felt driven by power, nothing else. There was seemed nothing more important to him. All in all, a very interesting read, and one that keeps your interest through out. 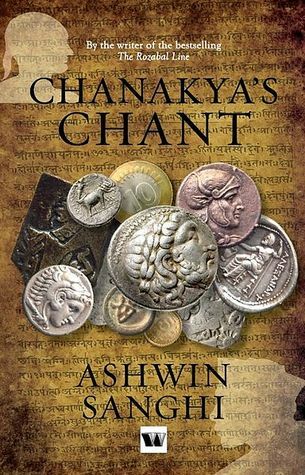 And finally – what about the title – Chanakya’s chant? Well, you will have to read the book to find out. All I can say is that it is sure to be interesting. I also enjoyed it much more than The Krishna Key.